I just wrote a short review about a really nice fly box, the Bugger Barn. 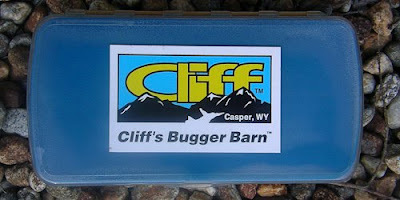 This product comes from Cliff Outdoors of Casper, Wyoming. It's a sturdy little bugger, and well worth looking at if you like organized fly boxes with good carrying capacity. The review is indexed on the page called Articles/Favorite Stuff. Or, you can skip the index and go directly to the review by clicking here.